When Gianna Eusebio was born after only 27 weeks, she was the size of a cellphone and needed extensive care to save her life. Now, the energetic 10-year-old is dedicating the next year of her life to raise money for the Neonatal Intensive Care Unit at the Winnipeg Children’s Hospital. When Gianna Eusebio was born after only 27 weeks, she was the size of a cellphone and needed extensive care to save her life. 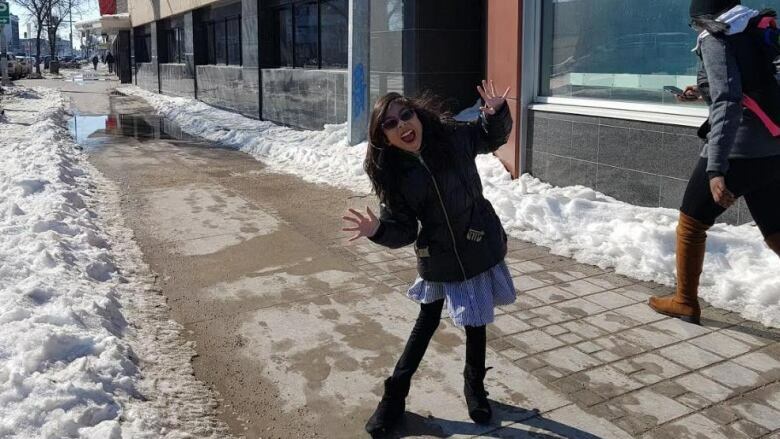 Now, the energetic 10-year-old is dedicating the next year of her life to raise money for the neonatal intensive care unit at the Winnipeg Children's Hospital. Gianna was named the Children's Hospital Foundation of Manitoba's Champion Child. "I want to help raise money to help the little babies," she told CBC radio's Up to Speed host Ismaila Alfa. Her mother, Tes, was diagnosed with preeclampsia and had to undergo an emergency C-section. Gianna was born blind, her lungs filled with fluid, and her heart stopped beating. After emergency surgery to restart her heart, she remained in the hospital for the next seven months. "Everything was pretty surreal," said her mother. "But I think how we handled it was that we just kept putting one foot forward, thinking positive and sending positive vibes to her that she's going to be well taken care of." Tes says she always knew they would work to give back to the hospital. "They put so much time and effort, not only Gianna, but helping us and supporting us through the whole journey. " Gianna will travel to Disney World in Orlando, Florida to meet other Champion Children from around North America. She's going as the ambassador for the 120,000 children that visit the Winnipeg Children's Hospital every year.